As a current leader of the communist clan, Nguyen Phu Trong mentioned many issues. Some of his explanations are helpful for individuals and organizations who are real anti-red Leninist colonial aggression clan to collect documents on its real face. 1/ Great communist Nguyen Phu Trong said: "In the reality this time, the contents of the constitution have apparently shown the corporeality and formalization; or in another way of speaking, legitimized the contents from fundamentals, regulations and resolutions of the Party in its relation with people" (sic). In this paragraph, it's Nguyen Phu Trong himself who insisted that the Constitution is totally belonged to the communists instead of Vietnamese people. It is the Constitution that built human rights as a foundation and a guarantee of self ownership. That means the author of the constitutional contents must be people who is the lone heir of Viet ancestors' heirlooms. No individuals or organizations have the right of leading a person who is the real owner himself. The Congress made by the communist bandit has never ever been represented to people. 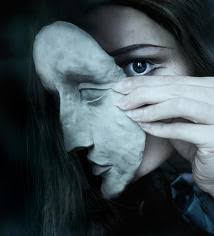 It is a mask of fake democracy of the bandit that great communist guy Nguyen Phu Trong has confessed as a Constitution that was "legitimized" from the contents which are fundamentals, regulations and resolutions of the communist party!! That constitution was written and passed by "congress" of 90% of top communist members. The rest are medium-high ranking party members. How are they eligible for representing of 80% population of Vietnam with their more than 90% representatives of 3 million communist party members? The request of human rights for people of Vietnam is a request of authorship of the constitution written by Vietnamese people. It is not requests of oddments made by lunar liars who sit under "Tan Trao tree" or beggarly horsy intellectuals. The organizing board should be less honesty or faked; or having lack of information if the conference for human rights they organized included Viet Tan clan. 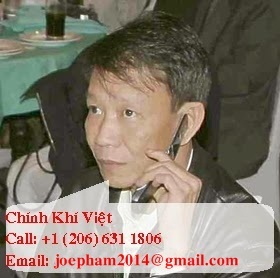 Let Viet Tan party clan - who has never ever been governed any single day but superior in cheatings, robbery and killings - participates in an organizing board of a conference for human rights of people of Vietnam is similar to a scenario of a remnant of scoundrels from a remote hamlet sit down to discuss on crimes of Mafia gangsters? With the current situation claimed by Nguyen Phu Trong in his interview, everybody would able to perceive that human rights in Vietnam are zero; from the day the government was seized by the communist clan!! Meanwhile, there are international organizations which are either bewitched or having no honesty at all when they performed magic games "categorization of human rights practice" in Vietnam now!! It is nonsense to categorize a practice which is zero; because of the categorization itself!? 2/ Great criminal Nguyen Phu Trong continued: "The communist party was born, survived and developed for the interests of people; or in other way of speaking, for its goal of independence and socialism which will bring wellbeing and happiness for people" (sic). Great criminal Nguyen Phu Trong graduated Ph. D. of "party building" (communist party). With such laureate level of education and currently general secretary of Viet communist party, he should not able to deny that he has never learned his own communist party history and its documents. His interview was made for Giap-Ngo spring welcoming and for 84th anniversary of his communist party's birthday; a birth of a political party named Indochina Communist Party which was born by Soviet who had appointed its general secretary; even its central politico staff members also had been chosen by the Soviet. Immediately after it was born, the communist clan made Soviet Nghe-Tinh riot (1930-1931) for their agenda of "digging off trees from their roots" to destroy four fundamental social classes of Vietnam. Was this riot carried out for the interests of people? Was it brought wellbeing and happiness for people? Was its fundamental policy of trans-formulization into bolshevik "slavery" of Vietnamese people and termination of national individuals, organizations and political parties for the interests of people or for the interests of red colonial Leninist Soviet?? Is it an ideal goal for "people's independence" (sic)?? a) Socialism is a first step of communism. In a socialist society, the distribution of social material wealth is "working by one's ability; earning by one's deeds". Under communist regime, its will be "working by one's ability; earning by one's needs"!! Many lazy and stupid persons had died because of this communist clan's propagandist advertise. This theory also said that people's unions will make distribution role instead of the governmental structure which will be dissolved at the timeline of communism. b) The socialist regime is governed by a political party of social working class named Communist Party. There is no private economy. There are only governmental (or state-run) and collective economies; both under absolute ownership of the communist party. Otherwise, people from outside of communist organizations are just red slaves who are employed and paid in different levels. Under leadership of the communist party, its government holds its role after Soviet's model of worker, farmer and soldier forms. Why is it so-called "Soviet worker, farmer and soldier" model? Because as a direct representative of the red colonial power Soviet (later with Mao China), the Viet communist clan has plundered its people of Vietnam directly. Since workers and farmers are manual labors, they are considered by their owners as slaved social classes. But with its demagogic propaganda, the clan told a lie that the Soviet model is consisted only workers and farmers. Soldiers belong to armed forces. The word "soldiers" was added into that Soviet model for the purpose of praising and exploiting these slaved soldiers later to crush riots from possible workers and farmers who do not accept their exploiting red slavery. It is a type of red colonialism; created by suppression force amid the building and consolidation of socialist regime; despite any blocking. c) It is possible for anybody; including the blinds to say that with hundred years to come, the communist clan could not be able to get the so-called "totally reform" and "democracy openness" as its great criminal Nguyen Phu Trong had defined when he told voters in Hanoi about his guess of an unimagined socialism at that future time! On international suitability issue, they will make a special favor for their socialist sibling countries because of their "socialist ideal". That means in current situation now, Chinamen must be first and Russians be second in their favorites. That phenomenon is proved on their $23.7 billion USD surplus trade in 2013, 45% increased to 2012! Meanwhile, the US market is the most surplus trade for Vietnam with $19 billion USD in 2013 and European market is next with $17 billion USD in trade. That meant Viet communists have taken US dollars of the US and EU to make "tribute" for China! That also meant the communist hands have robbed money from Vietnamese consumers' pockets to pay salaries for Chinese workers who got jobs from Vietnamese workers. These domestic folks have then been unemployed or been exported to Africa or South America as red slaves; or being illegal workers in European countries as "grass or straw-men". 3/ After the 11th Vietnam Communist Party Conference, great criminal Nguyen Phu Trong himself as party general secretary had an immediate press conference. He proclaimed to have democracy openness and promised fairness to a congressional election which he said 20% candidates will be non-party members among national party members, "people's army" soldiers and red slaved population who had been guaranteed of free speech and campaign. That was an opportunity that real fighters for people of Vietnam such as individuals, groups and organizations must show their political skill and knowledge of the communist clan and its malign schemes. Except fake activists, individuals such as "four toady poets" who have been busy for daily needs used to fight without political study and with their method of "the blinds tell fortune on what animal the elephant is"! Hence, those promises from great criminal Nguyen Phu Trong was just his clan's political deceit game for cheating of international leaders from distinguishing its fake "reform, democracy openness" as real stuffs. And if 20 of percentage was actually true as their "acceptance", then who gave the communists such authority?? With only 20% seats of representatives (communist lackeys as it were) reserved for 80 million people of Vietnam; meanwhile, 3.5 million of communist members got 80% of the seats; who is the owner; people of Vietnam or the communist clan?? To make sure of 100% victory on the election, beside its promise, the communist clan ordered its fake activists to "boycott" the election. They were organizations such as 8406, police organization of shaven-head arched legs ox-ghostly king Quang Do, humane high-movement of anti-war oversea student Nguyen Dan Que ..etc.. as well as oversea communist medias and the deaf blinds who loudly boycotted to protest the communist congressional election for their own fame; even they did not know when to boycott or participate in prevention of exposing their real faces. -Having opportunity for 20% non-communist candidates to unveil the crimes of the communists in answers to their voters. -Having opportunities - even with harassments or no intention of campaign - to show international public opinion the communists' crimes through their fake promise of "democracy openness" and there was nothing in "reform" and "democracy openness"; from their party's first day of birth until now. Following news from bbc.co.uk, there were only two such candidates like lawyer Le Quoc Quan and scientist Nguyen Phuc Giac Hai. Both of them were prevented from meeting with their voters. Even the voters had no permission to talk, how these candidates had any opportunity to speak to their voters! That was an actual important proof of negligence from organizations such as the Human Rights Watch, grand-embassies or general-consulates with their representatives in Vietnam, United Nation organizations, European Union, foreign media permanent representatives ... None of them came to visit those two candidates. No foreign media; including anti-communist Viet media oversea had thoughts of interview them to denounce the communists in front of international and domestic public opinions. Were they suddenly deaf-mutes and drunk-blinds?? 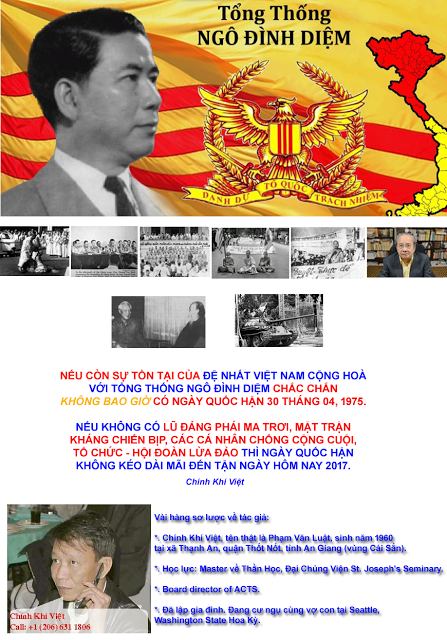 Self-claimed "anti-communist" Vietnamese oversea in France, United States, Australia altogether dishonored these candidates' private lives and discredited the answers of news-writer Viet Thuong with their comments on tinparis.net; proving from great criminal Nguyen Phu Trong's proclaim of "democracy openness" for 20% of non-communist candidacy. They were Ton Nu Hoang Hoa, Truong Minh Hoa, Kim Au Ha Van Son, Kiem Ai, Ho Cong Tam aka Do Cong Minh. Chinois Hua Vang Tho had sponsored those slaved writers and got helps from basset short guy Vo Van Ai and Phung Ngoc Sa who was ball-gathering boy for communist jailers in the concentration camps. If they were real anti-communist activists, at least they had shown to public opinion the steadily policy "human rights elimination of people in Vietnam" of the communist clan; made by great criminal Ho Chi Minh and his communist organization from their seizing of the government until now with great criminal Nguyen Phu Trong. After proclaiming of "democracy openness" and promising of fairness to a congressional election with 20% seats for non-communist candidates, great criminal Trong then ordered to reduce that percentage down to 7.5% nationwide; Hanoi and Saigon 5.5% respectively when he knew there were non-communist candidates so far. We needed to take that moment from their weakness of flip-flopping and deceitful habit to show international public opinion through anti-communist media that communist allegation. Also at that time, the request of candidacy right was really a peaceful struggle for human rights from those who fought for domestic fighters. They should be credited as real voice for democracy even fighting for only one real patriotic candidate alone. Except the voices of fake democracy individuals like Duong Trung Quoc and Nguyen Minh Thuyet. In the case that patriotic candidate was eliminated by the communists or got negligence by international public opinion, it was easier to prove who was the enemy of being-ruled people or the communists. From that perspective, we somehow might have appropriate measures and ways for struggles. There will be many encouraging results from news-writer Viet Thuong's writings on that communist congressional election if human rights fighters successfully pointed out the regime's grave site: the enthusiasm of voters against negative activities from immoral media and fake democracy fighters on tinparis.net. For that positive result, should Nguyen Phu Trong and his communist clan able to deny their guarantee of "democracy openness" and promise of fairness to a congressional election with 20% seats for non-communist candidates? Because there was a fact of two actual non-communist candidates who had publicly enrolled to run; caused the communist clan seemed to be in a deadlock for its "permission" up to 20% seats for non-communist candidates; this time, it did not make that mistake of failed political tactic at the UPR event in Geneva for periodical general review on human rights in Vietnam. Ultimately, who have the right of legislation among human rights; real representatives of people or representatives of the communist clan? If this very basic right had been limited or seized, the promise of Nguyen Phu Trong was totally just a paper cake his communist clan had given to being-ruled people of Vietnam from 1930 until now 2014! The people of Vietnam had been locked up by double slaved shackles during 100 years of French colonial aggression and rules, and Japanese fascists set their feet in Vietnam 1940 until the end of the Second World War. The victorious Allied forces came to disarm Japanese fascists in Vietnam; consisted Chiang Kai Sheik troops in the North and English forces in the South. These two forces were in fact similar to two rotten banana trees which slaved-people of Vietnam mistakenly thought them as life saving floats. In South Vietnam, English troops had helped their colonial French friends to come back after being kicked out of the country by the Japanese fascists. In North Vietnam, Chiang's troops looked a little better than Vietnamese dead victims from famine; caused by Japanese fascists who ordered to plant jutes and uproot rice trees. They used rice seeds for energy charcoals of power-mills. In addition to the manmade famine, some very rare trains of rice from the South for salvation of the North were burned by the communists from Indochina Communist Party. That was the political party which was born in 1930 with its motto "uproot all social classes of intellectuals, the wealthy, landlords and local officials" that created the 1945 worst famine in the North; together with its human rights violators consisted French colonials and Japanese fascists. Remember that in 1945, the population of Vietnam was 18 million (more than 10 million in the North). How great the crimes made by that triplet killing alliance of Japanese fascists, French colonials and Indochina Communist Party (changed into Vietnam Labor Party in 1951 and Vietnam Communist Party in 1976 until now) for such a population! They had made 1/5 of population - included 1/4 of farmers - died of famine in North Vietnam. Those victims had died slowly by hunger. In front of the death, they were ready to eat anything; from a piece of bone in a pile of feces or an arm of a dead person; even that person was a family member. That "human flesh eating" scenario had repeated again after April 30, 1975; experienced by some former officers and officials of Republic of Vietnam on their fleeing ways to freedom; had floated on unexplored islands after their small unfortunate boats sunk. Let not the hungers on their ways to freedom having this eating scenario in a vast ocean alone, it happened in all of communist prison camps; named with artful words of "re-education camps" throughout Vietnam. In those concentration camps, there was not a few of former high ranking officers or officials in their army and government had surrendered to their own hungers by committed batteries, thieveries or even worse; committed to be voluntary informants for communist jailers in exchange for foods and other favors from the enemy. Some of them are typical examples: Nguyen Tuong Tâm of Viet Tan who proudly introduced himself as a nephew of delusive "revolutionary" Nguyen Tuong Tam; or "news-writer" Tran Da Tu who got enough foods from his visiting family but had voluntary gave them to his jailers. He also wrote a song to encourage his inmates for harder working and more productions. Cung Tram Tuong aka Cung Thuc Can wrote a poem for birthday of great criminal "Elderly Ho". It is deficient not to mention of a "reference" in the story of Phung Ngoc Sa who worked as a tennis-ball picking boy for his jailers; similar to the role of Xuan Toc Do (red-hair Xuan) who worked for young female French colonials; a character of a same title infamous novel; written by great novelist Vu Trong Phung. It was a violation of human rights when Viet communist clan helped to cause such deaths of two million farmers of North Vietnam with its deeds and its policy. It violation was continued with its fundamental operation during 1930-1931 Soviet Nghe-Tinh event which was the first time they carried out its motto "uproot all social classes of intellectuals, the wealthy, landlords and local officials". They built statues, memorial monuments, memorial houses, museums, national parks for their communist criminals; included a vast park for memory of only a dozen youth pioneers in Ha Tinh province, another national park for memory of illusive communist martyr Le Van Tam right inside Saigon. Almost 70 years later, they have never built a memorial monument for two million farmers of North Vietnam who died by famine in the year of the rooter 1945. Why? Because they must prevent to recall the severe crime committed by French colonials, Japanese fascists and Indochina Communist Party - currently Vietnam Communist Party - to both old and younger generations in Vietnam; and even to international public opinion by building such memorial monument. The absence of such memorial monument; intentionally ignored by Viet communist clan to shield the crime of Japanese fascists and their own crime together, made Japan Emperor to bestow a medal to great criminal Phan Van Khai- as well as his communist clan - at the Imperial Palace. China and South Korea used to protest a visit of Japanese Prime Minister to dead fascists at their shrine; but Viet communist clan has never done that. They even kept silence like a dog eating on the sly; let alone protest. They secretly ordered crook Do Thong Minh to skillfully deny that crime for Japan on BBC.Co.UK; the issue that was written by Chinh Khi Viet before. 1/ Viet Minh: This was an abbreviation of a multi-political organization formed as a political front named Viet Nam Doc Lap Dong Minh Hoi (Vietnam Independent Alliance League). It was born in Nanking (China) following an idea of Honorable Ho Hoc Lam who had never been a communist as slaved communist historians are fabricated. Elderly Ho Hoc Lam was a revolutionary of Vietnam. He followed up two other revolutionaries Émigré Prince Cuong De and Elderly Phan Boi Chau. He was recruited by Chiang's army to become a source of supply for any Vietnamese individuals who were fighting for independence and liberty of Vietnam against French colonials. He was supported by Nguyen Hai Than, Vu Anh, Nghiem Ke To, Vu Hong Khanh, Nguyen Tuong Tam ... and got some funds from 1936 by Chiang's government in Nanking. Great criminal Ho Chi Minh was arrested by Chiang's General Zhiang Pakwei as a communist suspect. He was released only after begging Ho Hoc Lam, Nguyen Hai Than, Vu Hong Khanh for their bonds. After release from Chiang's prison, great criminal Ho Chi Minh asked to join Viet Minh and worked for it around area of Vietnam-China boundary. Based on Hoang Quoc Viet's memoir "First meeting with the Uncle", Ho Chi Minh met him and Truong Chinh for their first meeting in Cao Bang 1941. At that meeting, great criminal Ho introduced his fundamental document of Viet Minh Front to these great communist criminals for carrying out under banner of Viet Minh instead of Indochina Communist Party's bloody banner. Ho and his subordinates step by step took over this Viet Minh organization. Had non-communist delegation from Ho's words "multi-party organization" been participated in 8th Central Conference of Indochina Communist Party if Viet Minh Front was really born on May 19, 1941 during Indochina Communist Party's 8th Central Conference as written by slaved communist historians? Great criminal Ho Chi Minh could not deny what he wrote on his letter to Chiang's General. In that principle, China's Chiang went ahead to give Viet Minh permission and funds because there was no Indochina Communist Party included. Great criminal Ho Chi Minh had deceitfully downgraded other openly national political parties such as Viet Cach, Viet Nam Quoc Dan Dang and Dai Viet Quoc Dan Dang. He did not mention their nationalism by noticed them as simple as "participants". Meanwhile, communist Vu Anh of his delegation claimed himself as "nationalist" to shield his communist identity. Even in a situation of a dependent status, great criminal Ho Chi Minh had dared to show his identity as a member of a monopolist political party under banner of multi-party organization by omitting of nationalism leaned political parties on his letter. Unfortunately, long time but short sight politicians like Nguyen Hai Than, Vu Hong Khanh, Nguyen Tuong Tam, Nghiem Ke To ... had stepped aside on that critical incidence which their own child Viet Minh Front had been kidnapped by Indochina Communist Party. They later unwisely criticized their own Viet Minh Front as "less sensitive" on politic; unofficially recognized their child as whatsoever the child of gangster Indochina Communist Party!! Ho Chi Minh communist clan, lackey of Soviet-Mao China has violated human rights from its root of monopolist political practice!! a) The Indochina Communist Party was a tool of red-Leninist expansionist Soviet. It considered itself as a part of the Soviet Union and refused to recognize the concept of nationalism. That denial was written in its fundamental rules as a reason to sort out all individuals and organizations with nationalism. b) After seizing of the governing machine of Vietnam from nationalist parties, great criminal Ho Chi Minh needed to erase his handwriting on nationalist political parties' quest for independence by elimination of Viet Minh Front; created another front. -Vietnam Socialist Party of Nguyen Xien, its General Secretary and his deputy Hoang Minh Giam. Both of them were communist party members whose role was to unite the population. To Quoc was Vietnam Socialist Party's bulletin. -Vietnam Democratic Party of communist party members worked as under-covered cells such as Tran Dang Khoa, Cu Huy Can, Xuan Dieu, Nguyen Thanh Le, Huynh Van Tieng, Huynh Tan Phat, Vu Dinh Hoe ..etc..; added with Hoang Minh Chinh in 1953, chairman of Vietnam Student Association at that time. Vietnam Democratic Party's bulletin was Doc Lap. 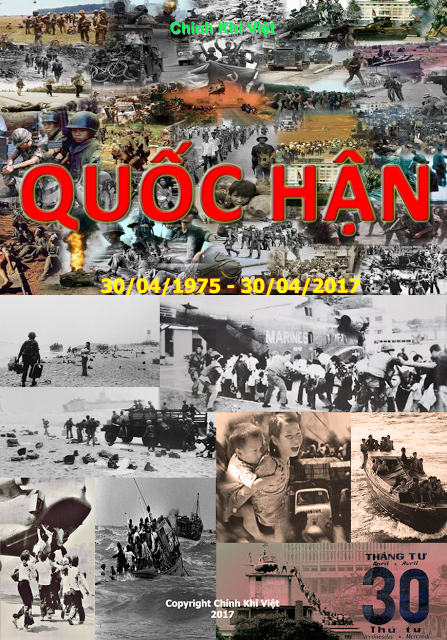 The bulletin of under-covered communist clan in Viet Minh Front was Cuu Quoc; published by Xuan Thuy as an important communist media during Lien Viet Front, Fatherland Front. This bulletin became Dai Doan Ket in 1976 after Fatherland Front was reorganized. Other nationalist political parties in the Viet Minh Front were eliminated with it by the communist clan; such as Viet Cach, Quoc Dan Dang and Dai Viet Quoc Dan Dang. Hence, new Lien Viet Front became a child of the communist clan. a) They laid their communist members staying put in Republic of Vietnam territory as their under-covered agents. This allegation was recovered by their own document: Solution number 23/1999/NĐ-CP issued on April 15th, 1999 for policy on "military and political cadres stationed in the South; arranged by the Party; following 1954 Geneva Treaty for Vietnam" (sic)!! At the end of 1955, the communist clan eliminated Lien Viet Front and gave birth to its Fatherland Front. The government of First Republic of Vietnam was aware not to be tricked by their trap "nationwide election for reunification of Vietnam" (please read analysis title "Ho Chi Minh: Ngo Dinh Diem is A Patriot" - Thoi Su Moi, issue number 62). 4/ Because of the allergic objection of national population with the name Indochina Communist Party, the communist clan must dissolved it and used Viet Minh Front as its hide-out. They hid their identity and worked behind the names of nationalist leaders such as most prestige advisor Vinh Thuy (King Bao Dai) and other high ranking mandarins Bui Bang Doan, Phan Ke Toai; province chiefs Ho Dac Diem, Vi Van Dinh; Meo ethnic King Ha Giang ... and religious leaders to form a coalition government which was able to organize the so-called National Assembly, session I. They had to keep current provincial and district officials as well before step by step changed their positions into new names. For example provincial Chief became Chairman of Counter-Resistant Commission Administration; district Chief became Chairman of Lien Viet Front. Vietnam Democratic Party of Duong Duc Hien with its bulletin Doc Lap; consisted of intellectuals, mandarins, capitalists, landowners, high ranking officials, businessmen, provincial and district chiefs and teachers. It was infiltrated with communist members of great criminal Ho Chi Minh who exploited those nationalist members' prestige to organize a great successful "gold fund-rising week" and used some of monetary gold to bribe China Chiang troops for their weapons seized from defeated Japanese fascists. Now even red-ranger Bui Tin has confirmed that "the role of counter-resistant government (or coalition government) was deep and large. Its governing structure was light and small. Its ministries' heads were intellectuals and specialists; included many non-communist ministers Phan Anh, Tran Dang Khoa, Nguyen Xien, Nghiem Xuan Yem, Ta Quang Buu, Trinh Van Minh, Le Dinh Tham, Hoang Minh Giam, Tran Duy Hung, Phan Ke Toai, Le Van Hien, Dang Phuc Thong, Ton That Tung, Tran Huu Tuoc, Tran Cong Tuong, Tran Dai Nghia, Ho Dac Di". "New government in the South consisted of selected patriotic intellectuals whose talents were almost extraordinary. They were Pham Van Bach, Ph. D. in law and bachelor in French literature from France, chairman of Counter-Resistant Commission Administration of South Vietnam, doctor Pham Ngoc Thach from Paris, France, Mathematic professor Pham Thieu, Literature professor Ca Van Thinh, Physic professor Dang Minh Tru from France, Architect Huynh Tan Phat, Law professor Tran Cong Truong, Engineers Nguyen Ngoc Nhat and Nguyen Ngoc Bich from Paris Encyclopedic university, Industrial engineer Kha Vang Can, Law professor Pham Ngoc Thuan (brother of Col. Pham Ngoc Thao), Lawyer Thai Van Lung and Pham van Chuong, Saigon governing administrator, a talented fame of governing. At that time in Viet Bac, the political role of "brother Nhan" (or Truong Chinh) was quite low. The role of communist party was not deep and large. The role of coalition government was deep and large" (sic - excerpt from "Mat That" of Bui Tin; page 70-71). With many under-covered communist members infiltrated into Vietnam Democratic Party but great criminal Ho Chi Minh clan was still considered that party as a giant stone to block the "role" of spreading bolshevik theory to nationwide population. For party members of Vietnam Democratic Party consisted of all 4 fundamental social classes of Vietnam that 1930-1931 Soviet Nghe-Tinh movement was ordered to destroy, the communist clan has continued to turn the country and its people into property of red Leninist Soviet colonialism. From the early days of Vietnam Democratic Party, except some infiltrating communist cells, most of its members followed its ultimate goal of fighting French colonials and creating a Vietnam with independence, freedom and happiness. Great criminal Ho Chi Minh exploited that patriotic ideal to print it on every governmental documents; including personal letters sent to each others. Unfortunately, leaders of Vietnam Democratic Party and other political parties Viet Cach, Viet Nam Quoc Dan Dang, Dai Viet Quoc Dan Dang ... had united all social classes of Vietnam without prevention of Ho Chi Minh clan from brainwashing and taming them in many ways. That tactic of great criminal Ho Chi Minh has been practiced again after 1975 on oversea anti-communist communities of refugees and inland; with fake "democracy, fighting, counter-reflection" organizations and their slogans of "openness", "reforms". For example the Dan Chu 21 group of pro-Soviet communist Hoang Minh Chinh, Tran Khue of storm-youths troop, block 8406 and Thang Tien of Nguyen Van Ly, organization of great incurved-leg shaven-head Ghostly Ox-king Quang Do whose lackey squatty basset Vo Van Ai helps to connect his clan to oversea communities. There are also political organizations such as Viet Tan, Quoc Dan Hanh Dong movement, Nhan Ban high-movement, Dan Toc and Vi Dan political parties and other outward communist and non-communist organizations. Look at the size of the budget that the communist clan partly shown to the public for understanding of how important its Solution 36 should be. In addition to 2.9 billion USD budget, there will be more funds could be given if necessary. US dollars from charitable fund-rising political games such as "Cam On Anh", "Phanxico Charity", "Blinds' eyes opening" or the case of modern Pho Doan Ton Nu Hoang Hoa's Chanh Lac of Nhu-Lai pagoda $4.8 million USD lawsuit. The cases of Block 8406 and Thang Tien of Nguyen Van Ly are examples of domestic politic. Who is Nguyen Van Ly when he claimed he was funded by 6 central political members to publish his bulletin and thousands of communist party cadres were waiting for baptism (or foot washing?) by him. He required members of his block 8406 to having their full name, occupation, address, phone number ... on their resume and also claimed having ten thousand of them! Where are they now? He performed "scapegoat" game with his choices of Thang Tien's members number 1, 2, 3 to be jailed in communist prison as "Le Loi, Le Lai, Nguyen Trai". Meanwhile, his own two nephews had been ascended to ... foreign country!! 5/ By the way, in such situation of not enough military forces and dared not to eliminate Vietnam Democratic Party, the communist clan had exploited that political party to organize "gold fund-rising week". In the same year 1946, it ordered Nguyen Xien, a loyal despicable engineer to form Vietnam Socialist Party to challenge Vietnam Democratic Party in uniting of intellectuals and worked as a lobbyist for it in connection with French Socialist Party to win French governmental officials; writers, news editors, historians such as Jean Chesnaux, Jean Lacouture ... in particular. The role of Vietnam Socialist Party in Vietnam was almost zero; particularly in the countryside because nobody would like to join it. 6/ Despite ads from slaved writers of the communist clan, nobody paid attention into its reason of "party gate opening" to recruit in great number; regardless of family back ground for its Indochina Communist Party which had no official opening yet; in order to open "political public trials" and collecting of agricultural tax as well as commercial and industrial taxes back-collecting. That was a political scheme against Vietnam Democratic Party in the decade of 1940s when most of victims were members of Vietnam Democratic Party; from the top to the bottom. For example: Dang Van Huong, intellectual, father of Bang Phong Dang Van Au (loyal subordinate of Nguyen Cao Ky and Dang Tuyet Mai; now a subordinate of red ranger Vu Thu Hien). a) After having agreements from nationalist parties on May 22nd 1946, great criminal Ho Chi Minh signed executive ordinance number 71 to unite all military and political forces (including security militia of predecessor Tran Trong Kim) into National Army (copies of ordinances exhibited in Ho Chi Minh museum, Hanoi). His secretary of defense was lawyer Phan Anh, no political party affiliation, former secretary of youths in Tran Trong Kim cabinet government. Phan Anh's predecessor was Vu Hong Khanh who was kicked out by great criminal Ho Chi Minh with Ho's skillfully dismissal of sending him to join a delegation for negotiation with French colonials in Da Lat. Meanwhile, great criminal Ho Chi Minh formed a parallel agency to ministry of defense called Military Political Commission; appointed Vo Nguyen Giap as its chairman. On Nay 26th 1946, great criminal Ho Chi Minh and ministry of defense Phan Anh and great killer Vo Nguyen Giap, Military Political Commission chairman went to Son Tay for grand opening of Tran Quoc Tuan military academy. Its director, scout leader Hoang Dao Thuy (older brother of Hoang Dao The Kiet, Republic of Vietnam Colonel); on behalf of his academy received a flag from great criminal Ho Chi Minh with embroidering motto of national army "Faithful to the Fatherland; Dutiful to national citizens" (Cuu Quoc bulletin; issue No. 250, May 27th 1946). On its procession of military aggression of Republic of Vietnam later years, the communist clan used that scout agency as a target for its infiltration of communist under-covered agents for its long term uses. There is no need to say who are useful for whom among other oversea scouts should you readers have watched closely. b) Should nationalist parties and non-communist elites, intellectuals at that time had to question themselves that why had two parallel systems - Ministry of Defense and Military Political Commission - together in a government to control the armed forces? And why after only two days of signing the executive ordinance to unite all military and political forces, great criminal Ho Chi Minh went to attend the grand opening of Tran Quoc Tuan military academy without at least the presences of representatives from national Congress and political parties in the unified army? The presence of Ho Chi Minh; personally with his embroidering flag of national army motto "Faithful to the Fatherland; Dutiful to national citizens" - in psychological warfare; to the academy and its officers presented that day - meant he is real "leader" of the national army. The role title Military Political Commission "chairman" of great butcher Vo Nguyen Giap sounded like more important than "minister" of Defense Ministry!! Furthermore, great criminal Ho Chi Minh also sent lawyer Phan Anh to join Pham Van Dong in France for Fontainebleau Conference. The trip made great butcher Vo Nguyen Giap a best opportunity to take over Phan Anh job as Defense Minister when the lawyer had just been in a very fresh seat. Hence from that time on, the communist clan had totally grasped the frame of the armed forces in its hands. When great criminal Ho Chi Minh went to France, he gave his power to non-communist patriot Huynh Thuc Khang who was Interior Minister at that time with little power. Minister Huynh Thuc Khang's naivety made him a game-card in the hands of great criminal Ho Chi Minh when he presided over the trial of On Nhu Hau; using judgments and verdicts of the communist clan from Chu Dinh Xuong and Tran Hieu of Police Bureau. That mistrial caused not only smeary spot on defendant's prestige but also the dispersion of nationalist-leaned political parties; including advisor Vinh Thuy without a fight! In the reality at that time, there were only two political parties Vietnam Socialist Party and Vietnam Democratic Party. Vietnam Socialist Party was similar as a crippled child. Meanwhile, Vietnam Democratic Party which had power but no connection with the army and police; similar as a lamed athlete! c) Great criminal Ho Chi Minh gave Vu Hong Khanh the cabinet position of Defense Minister at that time because of his strong army and the support from Chinese Chiang's troops under commands of generals Luuhan and Tsaowen who came to disarm defeated Japanese fascists. Vu Hong Khanh troops stationed in most provinces; from Lao Cai to Hanoi; including an army-column in Quan Thanh, Hanoi. There was a regular army unit named Ky Con in Hai Phong. For the great prestige of hero Nguyen Thai Hoc, the movement of youth self-defense recruitment was very strong. The prestige of Vu Hong Khanh was high and his military forces were strong too. Unfortunately, he did not take advantage of his strength for his political agenda. Living in Van Nam, China under military name "Teacher Giang", he spent most of his time for playing chest or card games with local government officials or Van Nam railroad agency office clerks. Meanwhile under cover of Viet Minh, great criminal Ho Chi Minh had taken great advantages of great names; such as Vietnam Democratic Party for gold and money, King Bao Dai and his mandarins for their prestige; even the education degree "undergraduate" of his own father (but omitted the detail of his mandarin title dismissal for his criminal crime of drunk and manslaughter). With those above exploitations, Ho grasped self-defense forces through the so-called Coalition government and its defense minister Vu Hong Khanh. He used Vietnam Democratic Party's fund-rising money to buy weapons from Chiang's troops who disarmed defeated Japanese fascist troops. With just only a single communist agent infiltrated into that self-defense force, it was able to be transformed into regular army of Coalition government through defense minister Vu Hong Khanh. In the reality, that army belonged to great criminal Ho Chi Minh through its military political commission of great killer Vo Nguyen Giap as chairman. For example, butcher Tran Do. From a bodyguard of Truong Chinh, he became military political commissioner of the capital regiment whose manpower was original coming from Hoang Dieu self-defense unit (Tran Trong Kim government named it to replace name Hanoi). d) Before Tran Trong Kim government was born, lawyer Phan Anh formed a youth movement for a French sport competition; organized by Ducroix. Because of that, great criminal Ho Chi Minh gave him the vacant defense minister seat of Vu Hong Khanh to him who had been minister of youth at the time. With the approval of Tran Trong Kim, Phan Anh had secretly opened a military academy for future officers of Vietnam (Japanese fascists already gave independence to Vietnam except foreign and defense ministries at that time). Ho had chosen Phan Anh to target his youth movement. At the opening ceremony of Tran Quoc Tuan (Ho didn't dare to mention Karl Marx, Lenin when he tried to exploit the prestige of Saintly Tran; as he usually made in Pac-Pó cave, Cao Bang in the past) military academy, in his address to the academy cadets, Ho described lawyer Phan Anh as if he had been Ho's long time subordinate. And these future officers probably could somehow become his propagandists later. Of course lawyer Phan Anh had been kicked out of his seat in the defense ministry during his accompanied trip to France with great communist Pham Van Dong as mentioned above; set up by great criminal, great devil, great communist Ho Chi Minh after he got his goal. Great murderer Vo Nguyen Giap took over Phan Anh's seat to control military forces directly with his role as defense minister, and under-covered members of Indochina Communist Party infiltrated into the army as a military political commission chief. e) Likewise after grasping military and police forces; given by naive leaders of political nationalist-leaned parties, during a cabinet conference of Coalition government, great criminal Ho Chi Minh had deceitfully asked for a temporary halt of an order from Tran Trong Kim government to dismiss and prosecute corrupted provincial and district mandarins. For this allegation, great criminal Ho Chi Minh was supported by those corrupted clan from that event. Moreover, the communist clan had understood from that day until now that it could able being survived amid corruption anyway. Its top priority goal has always been absolutely grasping of military and police forces. Experienced from that allegation, great criminal Ho Chi Minh had known well how to exploit the Americans. With his excerpt from the U.S. Declaration of Independence on his own copy, some French intellectuals were naively happy to swallow cyanide drops from his envenomed copy. Descendants of the great communist criminal now are reusing the old political feat of their guy "Elderly Ho" with more favorite situation; proving in the recently trip to the US of communist guy Truong Tan Sang. Besides the grasping of military and police forces that great criminal Ho Chi Minh got with good chances given by naive leaders of nationalist-leaned political parties, even the legislature of Congress also felt into victim of great criminal Ho Chi Minh by his delusion. Many writers now are still mentioned the gesture of great criminal Ho Chi Minh when he had given more than 70 seats to nationalist-leaned parties who had "coalition" to him. Why was there a strange incident as that? In the situation proving as above, Viet Minh Front consisted of different nationalist-leaned political parties; amid Indochina Communist Party was already dissolved by great criminal Ho Chi Minh. His list of candidates consisted members of Indochina Communist Party under the name of Viet Minh; meanwhile candidates of others were campaigned under the names of their own nationalist-leaned parties. The name of Viet Minh was very popular to the society of Vietnam under Viet Minh government at that time; especially to people in the countryside. The voters voted for candidates of Viet Minh because they were told by great criminal Ho Chi Minh that Viet Minh Front consisted of multi-political parties; not only Indochina Communist Party. Instead of request for candidates to campaign under their own political party names and ban for use of the name Viet Minh, the nationalist-leaned political parties had chosen a threat of boycott the election!! Why great criminal Ho Chi Minh had made a concession to the threat if not for reason of possibly losing the election; caused by the exposure of his candidates' Indochina Communist Party identity. The unacceptable political naivety of nationalist-leaned political parties has continued to help the communist clan today. They were fed with nationalist foods of First Republic of Vietnam. Now from oversea, they are almost become a chain-joint for the communist clan publicly. They are waiting for opportunities to join the so-called "multi-party regime" when the communist clan may ask them for. Its practice of uniting oversea ghostly political parties with fake political parties, associations inland has been a tactic to cover its unpatriotic communist identity. -Scorched-earth resistance, first step into nationwide poverty. -Nationwide mandate recruitment also opened the gate for Indochina Communist Party to transform legitimate national youths into discipline and enlistees; together becoming its party members. Each dead-in-action member will become "glorious flower" of the communist clan. This phenomenon caused mistakenly claim of "the communist party gets credit of fighting for independence against the French" by many Vietnamese and foreign writers who forgot that during the era of Indochina Communist Party's gate opening, many members acknowledged only that as Indochina Communist Party's members, they just fought for independence, freedom, happiness against French aggressors. None of them had ever known anything of building "socialism, proletariat revolution, Indochina Communist Party is a part of Third International (Soviet colonial ministry). None of them had also ever known that after being transformed into "bolshevik", it should be their turn to transform whole population of Vietnam into "bolshevik"! -After Chinese Mao had taken mainland China, great criminal Ho Chi Minh quickly went to Mao China and Soviet to ask for Stalin's orders. Battalion after battalion of National Army went to China for "brainwashing cadre, military training". This army was renamed into People's Army with its motto "loyal to the party" instead of "loyal to the country"!! The name "Military Political Commission" was cut short without word "commission" into unmasked "Central Party Military Attaché". It was a different head of armed forces that had been totally split off from anti-French Resistance Coalition government; publicly! For no longer Loyal to the Country but Loyal to the Party, that political party became a tool of red Soviet expansionism as a slaved army for foreigner. Soldiers were delusively turned from defenders of the fatherland against French invaders into slaved troops for Soviet; died for the allegation of Soviet expansion; first in three countries of Indochina and later into Southeast Asia. Were they victims of the communist clan who seized their human rights and forced them into slaved troops for foreigner Soviet from their role as soldiers of their fatherland Vietnam? During the so-called 1979 "North and Southwest conflict", it was up to million of them dead, wounded and missing in action! In the reality, the real goal of that war was for Soviet's single superior communist ruler instead of for any single interest of the fatherland and its people!! 8/ There was no longer just-cause when the role of Red Slaved Troops under "People's Army" uniforms has been "Loyal to the Party" (Vietnam communist party)! The existing of that army has been designed by the communist clan for its roles: "finishing of all duties; overcoming of all obstacles; defeating of all enemies" (enemy here have been peace, democracy, freedom and independence-loving Vietnamese people who were enemy of Viet communists). Therefore, the military history of these red slaved troops is totally against all material and spiritual interests of Fatherland Vietnam and its people! -Comrades of that red slaved military clan. That's the reason they have had no ability to explain the differences between Republic of Vietnam Armed Forces and Slaved communist troops in victories and losses. The motto of Republic of Vietnam Armed Forces has been "Fatherland - Honor - Responsibility"; different to "Loyal to the Party" (Vietnam communist party) from the slaved red communist troops. The slaved communist media, personnel or personal individuals are still praising themselves right now as "soldier of Elderly Ho's troops". The communist constitution insists the red slaved troops are "properties" of the communist clan. The requests from some being-ruled people in Vietnam for memorial of red slaved troops killed in the 1979 war against China expansionists come from fake democracy, fake opponents and fake anti-communism. Keep in mind that it was red slaved troops who helped the communist clan seizing of Vietnam governmental machine from anti-French coalition government. It was that red slaved troops who helped the communist clan invading Republic of Vietnam; dissolved the Constitutional Democracy created by President Ngo Dinh Diem. It was that red slaved troops who helped communist clan dared to come back under covered-name Vietnam Labor Party in 1951. It was that red slaved troops who helped communist clan to succeed for its plan of helping red Soviet colonials and great Han China expansionists to stay with real ownership of Vietnam. Firstly, with its 1930-1931 Soviet Nghe Tinh movement and nice words of Land Reform operation whose quota was killing of 5% farmers in North Vietnam. Next, it reorganized its party in order to exclude nationalist-leaned members who helped most in resistance against French colonial invaders, and party members who were tricked into the party during gate-opening time. It also carried out Cultural and Ideal Revolution to eliminate intellectuals and tamed those who were easy to be recruited. Its reform program of private Commercial, Industrial and Capitalist businesses proletarianized whole population of Vietnam and transformed their properties and national resources into the hands of red Soviet colonials and great Han China expansionists. Make senses of words the communists tricky used such as "Elderly Ho's troops, Elderly Ho's people, Elderly Ho's teenagers, Elderly Ho's country ... Elderly Ho's cereals"; even "Elderly Ho's salts" for what those meanings! And their tricky sentences like "Our parents just gave us births; only the Party (communist party) and Uncle (great criminal Ho Chi Minh) give us lives and his ideal"! Likewise, even death-penalty inmates must say before their executions "thanks to the Party (communist party) and Uncle (great criminal Ho Chi Minh)"!! After all, human rights in Vietnam were eliminated by great criminal Ho Chi Minh and his heir bandits from their early days of seizing governmental machine of Vietnam. Their troops and policemen have been their material tools, their constitution has been their legal tool, their current great Han China mother country is their protector. The vague and rustic definition of human rights by international powers has been a skillful encouragement to help the communist clan in its bluntly, distinctive and tricky seizure of human rights of Vietnamese people! Therefore, being-ruled people of Vietnam must consciously identify the culprit who used its tricky allegations to seize human rights of Vietnamese people is Viet communist clan who was born and nurtured by foreigners from its birth until today. In order to regain human rights from the communist clan, Vietnamese people must consciously unite to break these slaved-shackles and eliminate the Viet communist clan who is the owner of those shackles. In order to having actual international supports, we must obtain the approvals of people in the free world. They are apparently real owners of their countries and their votes. Hiến Pháp đó được biên soạn và thông qua bởi "quốc hội" với 90% là đảng viên VGCS chóp bu và số còn lại tối thiểu chức vụ cũng thuộc loại trung – cao VGCS. Tình hình hiện nay do chính Nguyễn Phú Trọng đã tự nhận qua cuộc phỏng vấn cho phép mọi người thấy rằng NHÂN QUYỀN Ở VIỆT NAM từ khi tập đoàn việt gian cộng sản cướp được bộ máy cầm quyền cho đến nay, hoàn toàn là con số KHÔNG!!! Vì vậy, có những tổ chức Quốc Tế làm trò ảo thuật xếp hạng “THỰC THI NHÂN QUYỀN” Ở VIỆT NAM HIỆN NAY là hành động hoặc mê muội, hoặc không lương thiện chút nào! Bởi vì đã là số không thì làm gì có cơ sở để xếp hạng??? Điều mà cương lĩnh chính của đảng công khai phải bolsevik hóa toàn đảng (tức đảng VGCS) để tiến tới bolsevik hóa toàn dân Việt Nam, nghĩa là “NÔ LỆ HÓA” cho Nga Xô, cũng như phải tiêu diệt những cá nhân, những tổ chức, những đảng phái theo tôn chỉ Quốc Gia cũng là VÌ LỢI ÍCH CỦA NHÂN DÂN VIỆT NAM hay là lợi ích cho thực dân đỏ Leninist Nga Xô??? Đó là mục tiêu lý tưởng “ĐỘC LẬP DÂN TỘC” (SIC) Ư??? 3/ Nhớ lại cái ngày vừa họp xong đại hội VGCS lần thứ 11, cũng chính tên đại việt gian Nguyễn Phú Trọng, với cương vị tổng bí thư, hắn đã vội họp báo tuyên bố mở rộng dân chủ bằng kêu gọi toàn đảng việt gian cộng sản, toàn thể ngụy quân việt gian trong cái gọi "Quân Đội Nhân Dân" và toàn dân (tức nô lệ đỏ) trong bầu cử “quốc hội” mà hắn đã quyết định dành 20 phần trăm ghế cho “đại biểu” không là đảng viên cộng sản, cũng như hắn bảo đảm quyền phát biểu và vận động ứng cử… hứa sẽ được đối xử công bằng. Đó chính là cơ hội để những cá nhân, tổ chức, đoàn thể THỰC SỰ DẤN THÂN ĐẤU TRANH CHO NGƯỜI DÂN Ở VIỆT NAM chứng tỏ nhậy bén về chính trị, có hiểu biết về căn cốt của tập đoàn VGCS và những âm mưu lưu manh của chúng! Loại trừ loại cuội ra, nếu đấu tranh kiểu “anh mù sờ voi” thường hay tự hào như "bốn anh làm thơ con cóc" để cho VGCS tiếp tục lừa đảo người dân Việt Nam bị trị, còn lo kiếm cơm đâu có thời gian để tìm hiểu về chính trị. Vì thế, phải thấy được rằng những điều cam kết nói trên của tên đại VGCS Nguyễn Phú Trọng chỉ là một tròTHÁU CÁY CHÍNH TRỊ của tập đoàn lưu manh cộng sản với ý đồ làm cho Quốc Tế thấy những bằng chứng “đổi mới, mở rộng dân chủ" để Quốc Tế có điều kiện nói với người dân nước họ rằng tập đoàn VGCS đã có tiến bộ về "mở rộng dân chủ!" Giả dụ chúng có thực thi những điều tuyên bố là “chấp nhận” cho người không là cộng sản được 20% số ghế trong Cuốc Hội bù nhìn đó thì thử hỏi xem AI CHO PHÉP CHÚNG CÁI QUYỀN ĐƯỢC QUY ĐỊNH NHƯ VẬY??? 80 Triệu Người Dân Việt Nam chỉ được có 20% ghế đại biểu (cứ cho là tay sai của VGCS) còn 3,5 triệu thằng đảng viên có tới 80% ghế đại biểu, thì hỏi rằng NGƯỜI DÂN LÀ CHỦ HAY TẬP ĐOÀN VIỆT GIAN CỘNG SẢN LÀM CHỦ??? Biểu lộ rõ nhất qua việc bầu cử, ứng cử “Quốc Hội” về công khai tuyên bố là 20% số ghế “quốc hội” không là đảng viên VGCS, bảo đảm sự công bằng và tự do vận động cho việc ứng cử, nhưng khi chúng thấy có người ứng cử không phải là đảng viên VGCS, thì chúng vội vã cho lệnh hạ chỉ tiêu 20% xuống thành 7,5% ở Hà Nội và Saigon là 5,5%. Chính lúc đó là lúc chúng đã bộc lộ ra yếu điểm mà chúng ta cần phải lên tiếng trên toàn bộ hệ thống truyền thông chống cộng để chứng minh cho dư luận cả trong và ngoài nước thấy được rằng tất cả những biện pháp chúng nó đã đưa ra rồi lại xóa bỏ chứng minh rằng bản chất lừa đảo cố hữu của bọn chúng chưa bao giờ thay đổi và quốc tế cần phải thấy được những điều đó! Nếu quan sát một người bị bỏ đói cho chết từ từ thì thấy rằng: Họ sẵn sàng ăn bất kể thứ gì từ một mẫu xương trong đống phân; từ một cánh tay người chết, kể cả người chết đó là vợ, là mẹ, là con đẻ của họ! Điều này chắc chắn một số Quân-Cán-Chính Việt Nam Cộng Hòa, sau 30/4/75, trên đường tìm tự do lạc vào các hoang đảo đã tự thân biết được cái việc “ăn thịt người” đó! Không chỉ trên đường vượt biển tìm tự do, mà ngay trong các nhà tù khổ sai của tập đoàn việt gian cộng sản, dưới mỹ từ “trại cải tạo”, đã có không ít các vị có học hàm, học vị cao; có chức vụ cao trong Chính Quyền cũng như cấp bậc cao trong Quân Đội Quân Lực Việt Nam Cộng Hòa… đã vì quá đói mà đánh nhau vì miếng cơm cháy; đã ăn vụng đồ thăm nuôi của người bạn tù; đã vì một giỏ thăm nuôi nghèo nàn mà có thể làm an-ten cho cai tù để tố giác đàn anh trong tù vào trại kiên giam…Thí dụ như thằng cán bộ Việt Tân Nguyễn Tường Tâm, luôn khoe là cháu ruột nhà “kách mệnh” mộng du Nguyễn Tường Tam!!! Còn có kẻ được thăm nuôi đầy đủ thì không dám ăn, phải để bụng cho cai tù như trường hợp “nhà báo” Trần Dạ Từ, lại còn sáng tác nhạc khích lệ anh em đồng tù hãy lao động thật tốt để đóng góp nhiều của cải cho trại cải tạo; hay nhà thơ Cung Trầm Tưởng aka Cung Thúc Cần khi vào trại giam Nam Hà, đã làm thơ ca ngợi, nhân sinh nhật thằng “cụ Hồ” đại việt gian cộng sản!...viết đến đây mà không nhắc lại "điển tích" nhặt banh cho cai tù VGCS của Phùng Ngọc Sa là một điều thiếu xót vì, điều bỉ ổi của Phùng Ngọc Sa giống hệt hình ảnh Xuân Tóc Đỏ cũng đã từng nhặt banh cho "đầm non thực dân Pháp" trong "sân quần vợt" mà nhà văn đại tài Vũ Trọng Phụng mô tả. Khi đại tội đồ Hồ Chí Minh bị tướng Tàu Tưởng là Trương Phát Khuê bắt tù vì nghi là hoạt động cho cộng sản thì nó đã năn nỉ để được các cụ Hồ Ngọc Lãm, Nguyễn Hải Thần, Vũ Hồng Khanh... bảo lãnh nên hắn mới được thả ra. Khi ra tù thằng đại tội đồ việt gian Hồ Chí Minh xin gia nhập Việt Minh và xin được về phát triển tổ chức Việt Minh ở biên giới Việt - Hoa. Cuối 1955, tập đoàn VGCS cho khai tử Mặt Trận Liên Việt, và cho ra đời Mặt Trận Tổ Quốc. Chính Quyền Đệ Nhất Việt Nam Cộng Hòa, đã rất sáng suốt để không mắc vào cái bẫy "tổng tuyển cử của cả hai miền Nam và Bắc Việt Nam" (Xin quý bạn đọc tham khảo thêm ở bài Bình Luận - Thời Sự Mới, số 62 có tên: "Hồ Chí Minh: Ngô Đình Diệm là Một Nhà Ái Quốc"). Tuy đã cài được nhiều việt gian cộng sản nằm vùng, nhưng tập đoàn VGCS Hồ Chí Minh vẫn coi đảng Dân Chủ là một hòn đá tảng ngăn chặn “trách nhiệm” bolsevik hóa toàn dân Việt Nam. Bởi vì đảng viên của đảng Dân Chủ là chính bốn giai tầng rường cột của Việt Nam mà Xô Viết Nghệ Tĩnh 1930-1931 đã được lệnh tiêu diệt để từ đó chúng biến đất nước và nhân dân Việt Nam thành tài sản của chủ nghĩa thực dân đỏ Leninist Nga Xô. Thuở đầu thành lập đảng Dân Chủ, ngoại trừ số VGCS được cài vào nằm vùng, còn hầu hết họ đều có lòng chống thực dân Pháp để xây dựng một nước Việt Nam độc lập, tự do, hạnh phúc. Chính vì nắm được cái tâm lý đó, nên tên đại tội đồ việt gian Hồ Chí Minh mới cho cái tiêu đề “Độc Lập – Tự Do – Hạnh Phúc” trên các công văn, kể cả thư từ cá nhân gởi cho nhau. Điều đáng tiếc là những người cầm đầu các đảng phái thời kỳ đó kể cả các đảng Việt Cách, Việt Nam Quốc Dân Đảng, Đại Việt Quốc Dân Đảng… và ngay cả cái đảng Dân Chủ này, đều mơ hồ đến mức vô thức đã đoàn ngũ hóa các tầng lớp người dân Việt Nam, giúp cho tập đoàn VGCS Hồ Chí Minh tiêu diệt bằng nhiều biện pháp khác nhau, hoặc bằng nhiều hình thức khác nhau để tẩy não và thuần hóa họ. Ngón võ đó của tên đại tội đồ, đại việt gian Hồ Chí Minh tiếp tục được sử dụng lại sau năm 1975 trong cộng đồng Người Việt Tỵ Nạn Cộng Sản ở cả trong nước. Nhất là sau cái gọi là “MỞ CỬA” và “ĐỔI MỚI”, đó là những tổ chức "DÂN CHỦ CUỘI, ĐẤU TRANH CUỘI, PHẢN TỈNH CUỘI” ở trong nước. Thí dụ như đảng Dân Chủ 21 của việt gian cộng sản thờ Nga Xô Hoàng Minh Chính và thanh niên xung phong Trần Khuê. Như khối 8406, Thăng Tiến của Nguyễn Văn Lý. Như tổ chức của đại việt gian cộng sản đầu trọc Ngưu Ma Vương chân cong Quảng Độ mà tay sai của nó nối ra hải ngoại qua tên đại VGCS kỳ cựu là basset chân lùn Võ Văn Ái. Rồi như Việt Tân, Phong Trào Quốc Dân Hành Động, Cao Trào Nhân Bản, Đảng Dân Tộc, Đảng Vì Dân… cho đến các đảng “bình cũ, rượu mới” như Đại Việt, Việt Nam Quốc Dân Đảng… cũng như các tổ chức ngoại vi của các đảng phái đó, cùng những phong trào lớn nhỏ nói trên. Hãy nhìn vào kinh phí được công khai hóa một phần của tập đoàn VGCS dành nuôi dưỡng những tổ chức đó thì đủ hiểu. Đó là quỹ của NQ 36 với 2,9 tỷ USD và nếu cần có thể bổ xung thêm. Đó là chưa kể số USD chúng gom được trong các trò từ thiện như “Cám Ơn Anh”, “Bác Ái Phanxico”, “Mở Mắt Người Mù”… Hay như Phó Đoan tân Thời Tôn Nữ Hoàng Hoa qua cái gọi là “Vụ Án Chùa Như Lai” Chánh Lạc với số tiền là 4,8 Triệu USD. Sau này khi tiến hành vũ trang xâm lược Việt Nam Cộng Hòa, tập đoàn VGCS đã coi tổ chức Hướng Đạo Sinh là một mục tiêu cài cấy lũ nằm vùng để sử dụng lâu dài. Khỏi cần nhắc lại, từ đó cho đến nay, một số hướng đạo sinh đã và đang hiện hữu ở hải ngoại có lợi cho ai, chắc chắn quý bạn đọc qua theo dõi có thể thấy rõ! b) Lẽ cra ác đảng phái có xu hướng Quốc Gia, cũng như các nhân sỹ, trí thức KHÔNG CỘNG SẢN lúc đó phải đặt cho mình câu hỏi: tại sao trong một chính phủ lại có hai hệ thống song song cùng có nhiêm vụ quản lý lực lượng vũ trang? Đó là Bộ Quốc Phòng và Quân Ủy Hội, cũng như chỉ sau có hai ngày ký sắc lệnh hợp nhất Quân Đội của các đảng phái, thì đại tội đồ Hồ Chí Minh đi dự lễ khai giảng trường võ bị Trần Quốc Tuấn mà thiếu sự hiện diện tối thiểu của Đại diện Quốc Hội, hoặc đại diện của các đảng trong Quân Đội Hợp Nhất? Như vậy, trên thực tế chỉ còn hai đảng là đảng Xã Hội và Đảng Dân Chủ. Đảng Xã Hội là hiện thân của một đứa trẻ con què quặt. Còn Đảng Dân Chủ tuy có thực lực nhưng lại HOÀN TOÀN không có một chút giây mơ rễ má nào với Quân Đội và Công An. Cho nên tình trạng của Đảng Dân Chủ lúc đó chỉ là một anh lực sĩ cụt chân! c) Đại tội đồ Hồ Chí Minh để Vũ Hồng Khanh lên chức Bộ Trưởng Quốc Phòng, vì lúc đó Vũ Hồng Khanh có lực lượng quân đội mạnh, lại có sự yểm trợ của quân LƯ HÁN, TIÊU VĂN của quân Tàu Tưởng sang giải giới quân Phát Xít Nhật. Tuyến đường từ Lao Cai cho đến Hà Nội, hầu như các tỉnh đều có quân của Vũ Hồng Khanh chiếm giữ, kể cả đạo quân ở Quan Thánh, Hà Nội. Ở Hải Phòng có cả một đơn vị chính quy mang tên Ký Con. Phong trào thanh niên gia nhập tự vệ rất đông vì UY TÍN của ANH HÙNG NGUYỄN THÁI HỌC. Vì thế uy tín và tiềm lực quân sự của Vũ Hồng Khanh rất lớn. Có điều ông ta không tận dụng được những lợi thế đó, vì khi ở Vân Nam (Tàu), núp dưới cái tên “ông giáo Giảng”, phần lớn chỉ đánh tổ tôm và đánh chắn với các ông phán, ông ký làm ở sở hỏa xa Vân Nam. Sự ngây thơ chính trị không thể chấp nhận được của mấy đảng có xu hướng Quốc Gia đó vẫn tiếp tục góp sức cho tập đoàn VGCS khi bọn họ ăn cơm của Nền Đệ Nhất Việt Nam Cộng Hòa và ngày nay ra đến hải ngoại thì thoải mái hầu như công khai trở thành chân rết của tập đoàn VGCS, chờ cơ hội để được tham gia vào cái gọi là “CHẾ ĐỘ ĐA NGUYÊN” khi tập đoàn VGCS cần đến sự kết hợp của các đảng, phái MA TRƠI Ở HẢI NGOẠI, với lũ đảng phái, hội đoàn cuội ở trong nước trong việc hóa trang, thay quần đổi áo che đậy thân xác việt gian buôn dân bán nước của chúng!!! -Tổng động viên kết hợp với mở rộng cửa đảng cộng sản Đông Dương đã khiến lực lượng thanh niên được chính danh đoàn ngũ hóa để vừa chiến đấu nhằm đưa họ vào kỷ luật, từ đó đưa họ vào chiếc cổng đã mở rộng thành đảng viên cộng sản Đông Dương. Và, mỗi đảng viên cộng sản Đông Dương được kết nạp kiểu như thế nếu chết vì chiến đấu sẻ biến thành “một đóa hoa quang vinh” cho tập đoàn VGCS. Sự ngộ nhận đó khiến nhiều ngòi bút cả Việt Nam cả Ngoại Quốc cho đến tận nay vẫn nhắc đến rằng “đảng cộng sản có công đánh pháp giành độc lập” !? Họ quên rằng thời kỳ mở rộng cửa đảng cộng sản Đông Dương lúc đó, người đảng viên bị dụ rằng vào đảng (tức việt gian cộng sản) để đánh giặc Pháp giành độc lập, tự do và hạnh phúc cho toàn dân, chưa một người nào được biết cái gọi là “xây dựng chủ nghĩa xã hội, làm cách mạng vô sản hay đảng cộng sản Đông Dương là một chi bộ của Quốc Tế III (tức bộ thuốc địa của Nga Xô)” , cũng như chưa một ai được học tập để biết rồi đây mình sẽ bị “bolsevik hóa” để đến lượt mình sẽ “bolsevik hóa lại toàn dân Việt Nam”!!! -Khi Tàu Mao làm chủ lục địa thì đại tội đồ Hồ Chí Minh vội qua Tàu Mao rồi qua Nga Xô xin chỉ thị của Stalin. Các đơn vị của Quân Đội Quốc Gia lần lượt qua Tàu để được tẩy não trong cuộc “rèn cán, chỉnh quân” . Sau khi trở về lại Việt Nam thì bị đổi tên thành Quân Đội Nhân Dân, với tôn chỉ “Trung Với Đảng” thay cho tôn chỉ “Trung Với Nước” !!! Tổ chức Quân Ủy Hội thì bị cắt cái đuôi chữ “HỘI” để hiện nguyên hình là Quân Ủy Trung Ương, đầu não của lực lượng vũ trang mà biểu hiện đó hoàn toàn tách khỏi chính phủ Liên Hiệp Kháng Chiến chống Pháp một cách công khai! Khi không còn Trung Với Nước mà chỉ Trung Với Đảng, mà cái đảng đó lại là công cụ bành trướng cho chủ nghĩa thực dân đỏ Nga Xô thì hiển nhiên cái lực lượng vũ trang đó đã trở thành BINH NÔ cho ngoại bang. NHỮNG NGƯỜI LÍNH BỊ LỪA ĐẢO TỪ NHIỆM VỤ CHỐNG XÂM LƯỢC PHÁP, BẢO VỆ TỔ QUỐC VIỆT NAM THÌ THÀNH BINH NÔ CHO NGA XÔ, CHẾT CHO ÂM MƯU BÀNH TRƯỚNG CỦA NGA XÔ RA TRƯỚC HẾT LÀ TOÀN THỂ BA NƯỚC ĐÔNG DƯƠNG, TIẾP THEO LÀ ĐÔNG NAM Á. Nghĩa là đám binh nô đỏ đó đã bị chết, sẽ bị chết do tập đoàn VGCS lừa đảo và cưỡng bức, thì xin hỏi đó có phải là nạn nhân bị tâp đoàn việt gian cộng sản TƯỚC BỎ NHÂN QUYỀN KHÔNG bởi vì họ từ một chiến binh của Tổ Quốc Việt Nam biến thành binh nô cho ngoại bang là Nga Xô??? Vì thế người dân Việt Nam bị trị phải tỉnh táo nhận thức được rang TỘI PHẠM TƯỚC ĐOẠT NHÂN QUYỀN CỦA TOÀN DÂN VIỆT NAM LÀ TẬP ĐOÀN VIỆT GIAN CỘNG SẢN đã mưu ma chước quỷ thực hiện từ khi chúng được NGOẠI BANG cho ra đời; NGOẠI BANG nuôi dưỡng bằng cách này hay cách khác cho đến tận ngày hôm nay.